A courtesan was originally a woman who attends the court of a monarch or other powerful person. 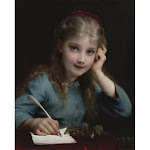 In fact, the verb "to court" originally meant "to be or reside at court", and later came to mean "to behave as a courtier" and then "to pay amorous attention to somebody". The most intimate companion of a ruler was called the favourite. Later referred to as the ruler’s mistress. 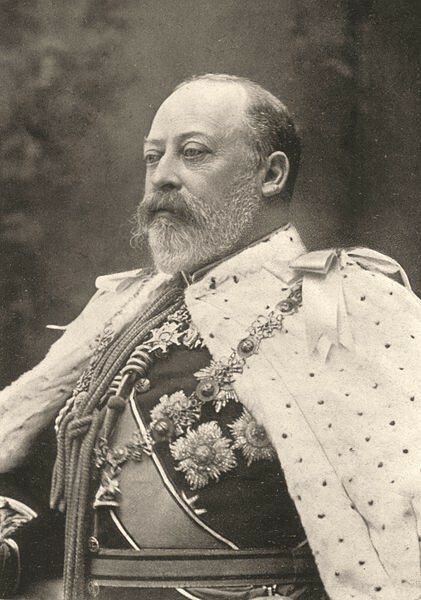 Victoria's son Edward VII, who ascended on 22 January 1901, was a much loved king. Although notorious for his many infidelities, each of these affairs were carried out in a kind and discreet manner, which did much to endear him to his subjects. He loved horse-racing, gambling and women! 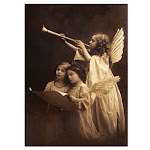 This Edwardian Age was one of elegance. Edward had all the social graces and many sporting interests, yachting and horse-racing. He received criticism for his apparent pursuit of self-indulgent pleasure but at the same time he received great praise for his diplomatic skill, and affable and kind good manners. Bertie, an avid theater goer, became enamoured with Sarah. He visited her often at the theater and lavished her with gifts of jewels. He was a frequent guest at her home and they became close friends as well as lovers. Their relationship lasted from 1870 through 1890. 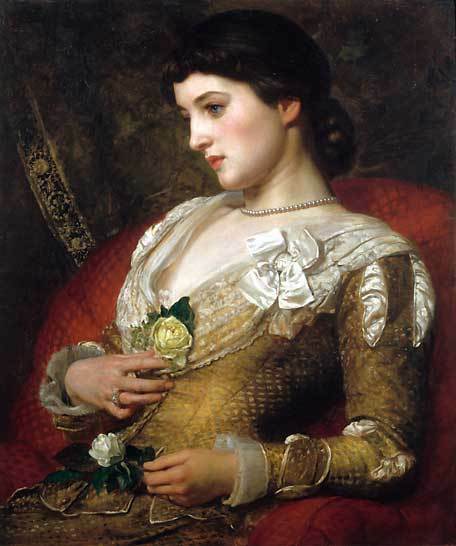 She was one of the bevies of beauties seated in the King’s box at "The Abbey" during his coronation. 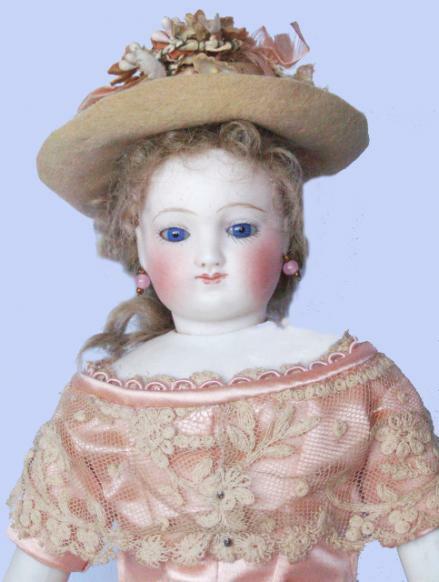 French poupee with a Barrois look and a very unusual round face. Large cut blue almond shaped and delicately painted eyelashes. Original blonde mohair wig over cork pate. Pierced ears. Original kid leather body. 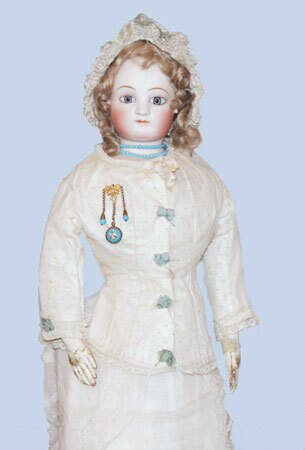 Wearing her original, two-piece white dotted swiss walking suit with matching bonnet. 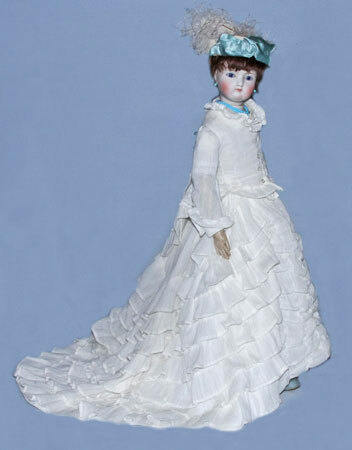 Her aqua bead necklace and antique aqua pin accent the aqua silk ribbon trim in her day dress. 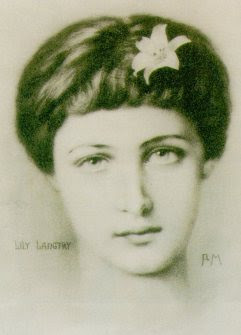 In 1877 a woman of an unusual beauty arrived in London; Mrs. Lillie Langtry, whose nickname was "the Lily of Jersey.” She had great femininity, confidence, and a supreme ambition. 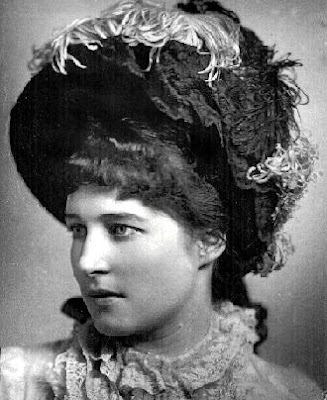 Married Edward Langtry, who owned a ship, but was not the rich man she wanted. Still, she used him as a step to climb in London's high society. 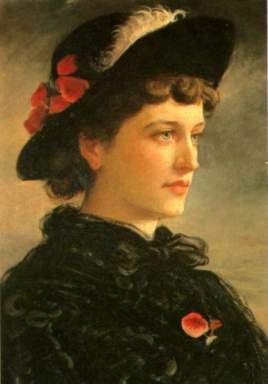 She was admired by magnates and princes, among them, Prince Leopold, Queen Victoria's youngest son. But none of them could maintain their position by Lillie's side when the Prince of Wales fell in love with her. 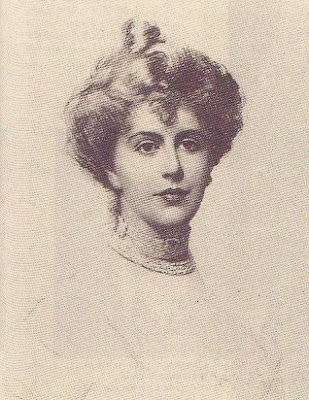 Considered the greatest beauty of her day, Lillie became the Prince of Wales's official mistress. Bertie showed himself with Lillie in public, everywhere in London. She caused such a splash in Society that on the day that she was presented in Court, Queen Victoria, who usually retired from the festivities early, stayed in order to see "what all of London was talking about." 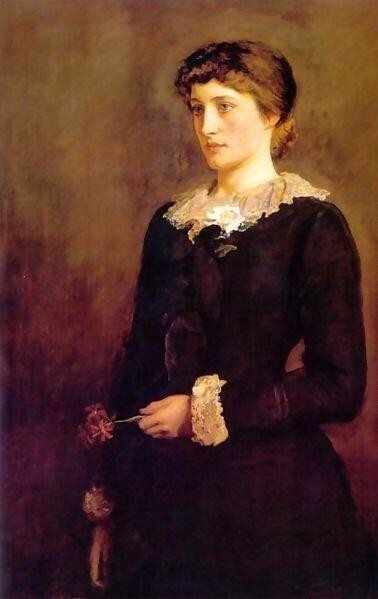 Alexandra knew about the "Lillie affair" too and she accepted it. She knew that if she complained she would be herself humiliated, so she resigned herself in silence; she even invited Lillie to Marlborough House. Edward remained fond of her through out the years and he even help her to be accepted in the theatre as an actress. Despite the fact that she lacked any sort of talent, the performances in which she acted sold out. In 1881, she was succeeded by Daisy, Countess of Warwick as Edward's mistress, but she remained friends with the Prince for the rest of his life. Swivel head on shoulder plate, cobalt blue glass eyes and all original costume. The lady in the original oil-on-canvas portrait is no other than Jenny Jerome (Lady Randolph Churchill). This is a painting by one of the greatest American portrait artists of all time, John S. Sargent. 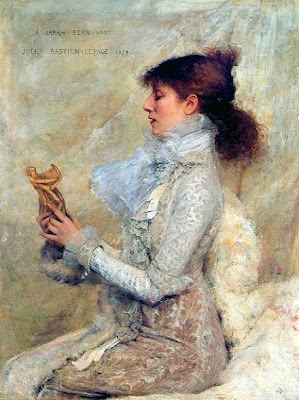 But, this painting is quite mysterious as there is no record of a finished portrait till the date although the Sargent studies of Lady Churchill are widely known. 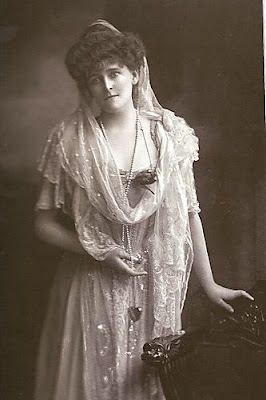 Anyway, the necklace worn by Lady Churchill in the painting was a gift to her from King Edward. The dress worn by her would have been very outrageous that time. She was part of Bertie’s social circle and soon became a close friend. 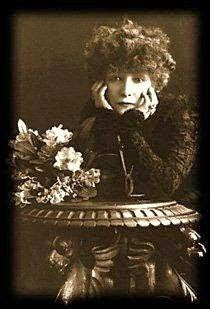 Soon she was sporting the jewelry that he was known to give women that he was intimate with. Although their affair eventually cooled, they remained friends for the rest of their lives. French fashion poupee by Rohmer. 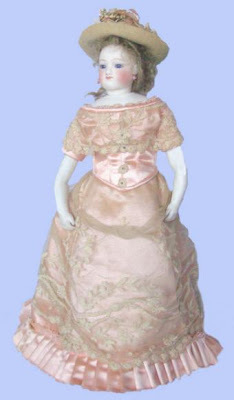 Gorgeous pale bisque with beautiful blue enamel glass eyes enhanced by delicately painted eyelashes. Beautifully shaped closed mouth with lip shading and outline painting. Pierced ears with tiny pink ball earrings. Original ash blonde mohair wig and fully gusseted body. Wearing an antique pink silk french dress with ecru lace overlay and fully pleated hem.... On her head a lovely light grey antique felt hat with pink silk ribbon trim, lace, and antique cloth flowers in white and pink. 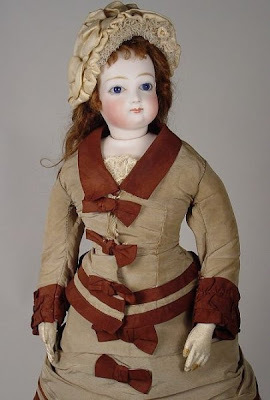 Antique undergarments and black antique fashion boots. 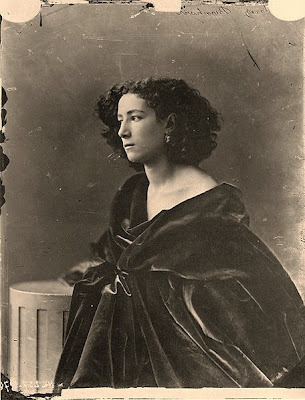 Following her marriage and the birth of her children, she became a socialite, attending lavish parties and gathering. She and her husband were members of the Marlborough House Set, headed by Albert Edward, Prince of Wales. 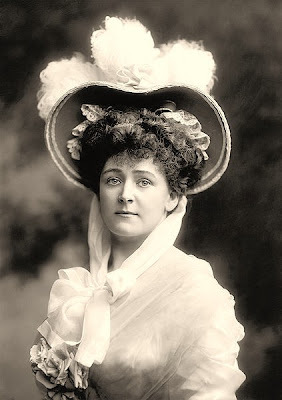 Beginning in 1886, she became involved in affairs with several powerful men, most notably Edward VII. 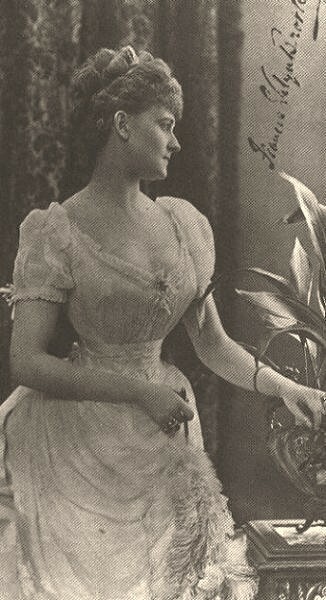 It was not uncommon in the Victorian era for married women of social prominence to become romantically involved with a man higher on the social ladder than her husband. This was often with the husband's knowledge, as it could also assist in his advancing socially or politically, and was considered normal for the times. 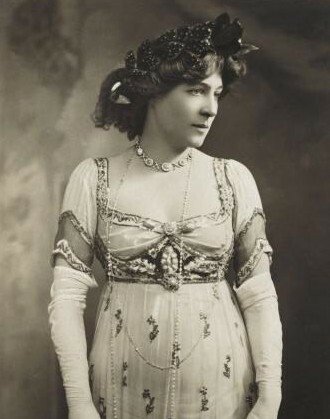 Lady Warwick's affair with Edward VII, lasted until 1898, Her main flaw when acting as a courtesan for powerful men was that she lacked the ability to keep her affairs private, and when involved with a man of wealth and power, she had a distinct habit of divulging it to others. 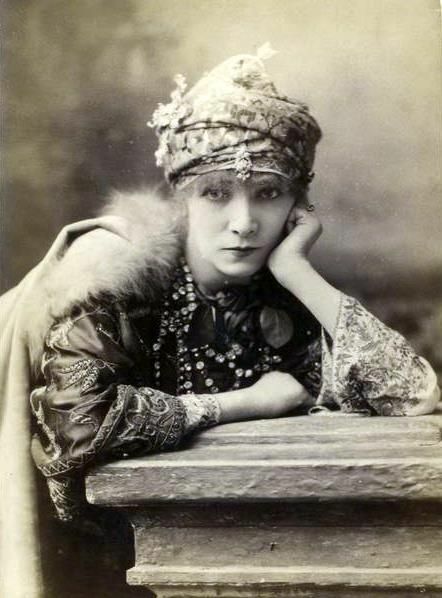 Often, a courtesan could have a prolonged career simply based on that one characteristic. 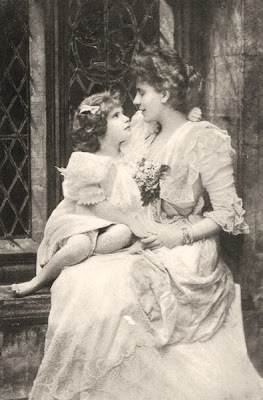 For her indiscretions and this habit, she earned the nickname "The Babbling Brooke", and she was the inspiration for the popular music hall song "Daisy, Daisy". Following the Death of Edward VII, and having large debts, she tried to blackmail his son, the new King George V. She threatened to make public a series of love letters written by Edward VII. It was the cunning expertise of the Private Secretary that managed to stop publication by arguing that copyright belonged to the King. Daisy found herself outmaneuvered and died virtually penniless. Wax figures borrowed Madame Tussaud’s show us a young Winston Churchill hobnobbing with his betters, Daisy preparing for the evening soirée, and Edward, Prince of Wales, enjoying a cigar and brandy. Closed-mouth J.D. Kestner, a perfect socket head model upon a bisque shoulder plate, the head is simply impressed 15. Details include gorgeous bisque with exquisite painting, blue glass sleep eyes and a lovely human hair wig, all on a hinged kid body with lower bisque arms.Beautifully costumed as a lady, with a marvelous hat and antique leather heeled boots complete the sublime presentation. Was a British socialite and the most famous mistress of Edward VII. Pretty, articulate, and discreet, Keppel quickly climbed the society ladder through affairs with prominent men of the day. Known as a very attractive woman, her extramarital affairs were usually initiated by her desire to gain a better social status. 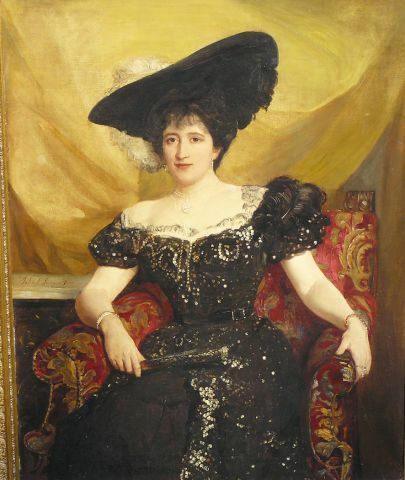 Her success as a courtesan has tended to eclipse any accomplishments of her husband. Most of her affairs were conducted with his full knowledge. 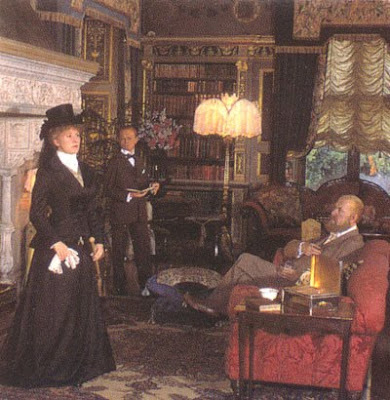 Edward VII even visited her house on a regular basis, her husband conveniently leaving during the visits. 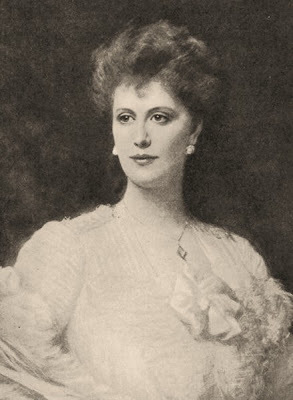 Edward's wife Alexandra of Denmark was on good enough terms with Keppel to send for her and to permit her at Edward's side when the King was on his deathbed. The Keppel-family rose to renewed prominence with the marriage of Alice's great-grand-daughter, Camilla Parker-Bowles (nee Shand) to Charles, Prince of Wales in April 2005. Courtesans were usually well-educated and worldly. They were typically chosen on the basis of their beauty, "breeding"—social and conversational skills, intelligence, common-sense, and companionship. They were expected to be well-dressed and ready to engage in a variety of topics ranging from art to music to politics. In some cases, courtesans were even married to husbands lower on the social ladder than their clients. In these cases, their relationships had the potential to improve their spouses' status -– and so, it was not unusual that the husband was aware of his wife's profession and dealings. Affairs of this sort would often be short-lived, ending when either the courtesan or the courtesan's spouse received the status or political position desired. More often than not a woman serving as a courtesan, would last in that field only as long as she could prove herself useful to her companion. But few lasted long, and after serving a prince or king there was nowhere to go but down. 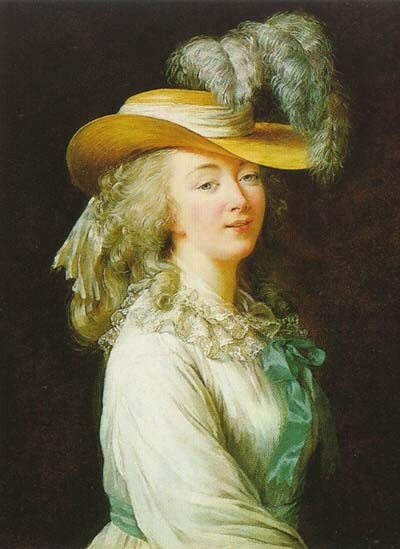 Madame Du Barry was one of the most famous Courtesans of France and the Mistress of the former King Louis XV. 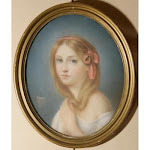 She was of humble origins – a fact that made Marie Antoinette, as the new Dauphine, cold-shoulder her. However, due to her association with the King of France, Madame Du Barry for a long time enjoyed a high status and privileged position in the French Court. The French Revolution broke out in 1789 and in the Reign of Terror that followed, scores of hapless people, whose only crime was of being of aristocratic stock or associated in some manner with the royalty, ended their lives on the guillotine. A prominent victim was Madame Du Barry, She was accused of treason and quickly sentenced to death, her final moments were neither peaceful nor dignified. As she was dragged before the blood-thirsty mob in the Place de la Concorde to be guillotined, she screamed and shouted and wept and begged for mercy. She tried to cling to life until the last, famously crying to the executioner, "Encore un moment, monsieur le bourreau, un petit moment!" (Another moment, Mr. Executioner, just a little moment). Queen Alexandra stands next to King Edward VII at his coronation. 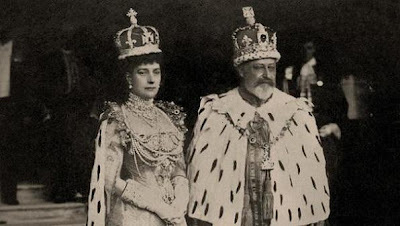 The coronation was originally scheduled for June 26th, 1902, but Edward had to undergo an emergency operation, so it was postponed until August 9th, 1902.
a country that had sorely missed the presence of their sovereign during Victoria’s extensive mourning period. 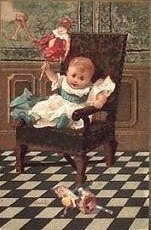 Un relato fascinante...las muñecas y sus vestimentas...las imágenes todas...gracias por compartir la historia. Another interesting post! Thank you! Don't quite agree with "Despite the fact that she lacked any sort of talent", she was very intelligent and would today be called a celebrity. He didn't really choose his wife, but had good taste in women. Ah, los reyes y sus amantes...!!!! Leída la historia de Eduardo "el juerguista" parece como si fuera muy lejana y en realidad solo "hace 2 dias", ja, ja, ja!!! Hoy en dia debe de ser lo mismo, pero los reyes europeos son más discretos. La figura de cera de Daisy lleva el típico traje de montar con la fusta en la mano, no se si la representaron así con segundas intenciones... je,je,je!!! Gracias Maria!...Yo estoy fascinada con su historia, despues de haber visto unos episodios sobre su vida por la BBC. Tenia muy buen gusto en las mujeres y gozaba de la vida. Aunque murio relativamente joven., fue uno de los mas queridos reyes de Inglaterra. "Hermes"...Thank you for your comment...Amazing women all of them...Did you know the Lilli was the love one of our colorful figures of the Wild West "Judge Roy Bean" (self appointed judge)fell in love with a picture of her and he even named his town after her. Sadly never met her. I'm glad you liked the post. It was fun for me as well. Thank you Ma Cristina and Josje... I'm so pleased you enjoyed it, it was a lot of fun for me, to dig all this information. He was quite the ladies man...lol! 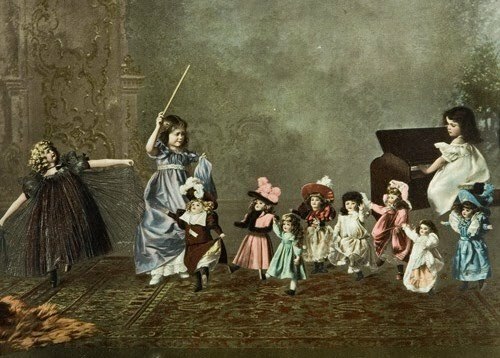 Another wonderful post, I love that you put all the dolls into a sort of context. Ví hace muchos años algo de la BBC sobre Lily Langtry, pero no recordaba su historia con Edward. Y lo de la Bernhart, desconocía esta relación. El debía de ser una persona fascinante para coseguir estas conquistas. Claro que la realeza es lo que tiene! Y el afán de notoriedad de ciertas damas! En estos casos, siempre me llama la atención la actitud de la esposa. La abnegación de Alexandra es lo que me conmueve. Creo que demostró tener clase y distinción, además de abnegación. Beautiful dolls! I love the dresses. I love the look of that period. The J.D. 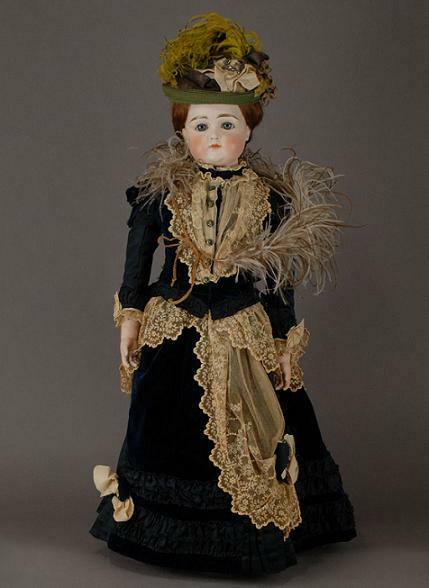 Kestner doll... ¿no parece una candidata a víctima de Jack the Ripper? Ha sido fascinante, como siempre! Thank you Susie, I am glad you noticed. 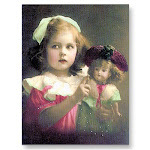 I try to include dolls on all the posts,so as not to deviate from the original purpose of the blog, but definitely they must fit the story. Muchas gracias por tus elogios. Si, Alexandra era una "santa" y una belleza a la misma vez. Nunca tubo unas palabras de reprocho o insultantes para Edward. Bueno al menos que la historia no los informe. Those showbiz chicks do get the attention they crave! 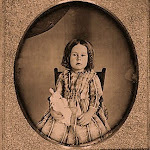 Sarah Bernhart has always been a fascination to me and we share the same birthday. This was an amazingly enlightening post, Marta. Now I know even more what they have meant in saying behind every great man is an even greater woman. And of course the clout that being a trophy wife would be in today's world. Beauty is something most people require in some form or other. Most fascinating! Thanks Christine for your sweet comment...Its so good to hear from you! I am so glad you find this post interesting, your thoughts are always right. Thanks for your wisdom. Your photos and illustrations are always so gorgeous and inspiring Marta. I love your historical information and will savor reading this during a moment of free time.